"Yo, ho, ho and a bottle of rum! Hoist the mainsails and raise the flag, maties, and let all who see it tremble in fear for their doubloons and lives!" We can’t give you the exotic, adventurous life of a pirate on the high seas, but we can offer the next best thing – this cool flag featuring the iconic Jolly Roger (aka skull and crossbones), boldly sized and centered on a black background. Ours isn’t just any old pirate flag, however. 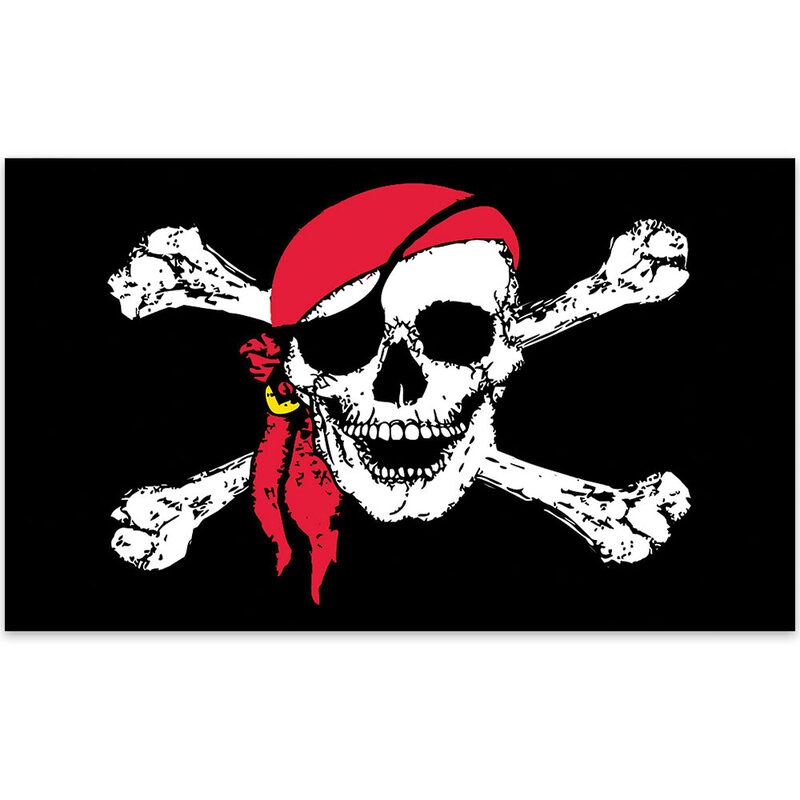 The Jolly Roger in this stylish banner is sporting his best buccaneer duds – a vibrantly colored red head scarf, knotted in classic pirate fashion; a single golden earring, stolen from a wooden chest along with lots of other booty, no doubt; and – of course – the ubiquitous pirate eye patch (which begs the question – why does an eyeless skull need an eye patch?). Whether flown on a pole, hung on a wall or ceiling, or even framed, this eye-catching pirate flag enhances any space in your home, office, workshop, studio or boat, even if you’re just a common land lover. You don’t have to be a swashbuckling privateer to recognize hip designs and cool accents, after all. At 3’ high x 5’ long, our scarfed Jolly Roger flag is perfectly sized for practically any location or application. It includes sturdy metal grommets to facilitate hanging or flying, and its tough polyester construction prevents tears, wicks away moisture and resists fading, both indoors and out. Display one of these striking flags in or outside your own home, and get a second one to give to a friend. It’s a distinctive gift sure to be remembered and appreciated for years to come!